Kojima Company are offering an 11% discount on all pearls, through January 11. Use the discount code ilovepearls, and believe me, you will love yours! Years ago, I noticed that pearl earrings were the ones I wore most. They lit the face, glowed in any light, and were a way to enjoy the gem for less expense than a necklace. But let's be choosy; too many earrings depend on the label "genuine pearl", but they're pedestrian. Some stellar examples below, chosen for daily wear– and to make every day a delight. Annette Ferdinandsen's pearl "cherries" on 18k stems are playful everyday earrings. Abut 3/4 in. long; price, $330 from Twist. 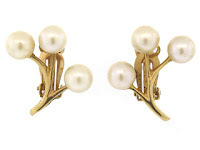 Beladora II offer a sprightly version, pearls on 14k twigs, a mid-century piece, for $395. These have clip backs. Often, I just want the pearl, for a pearl so presented displays essence. Even pearl studs from very high end jewelers can disappoint, with no discernable life. Gumps make impeccable studs, and I'd choose a luscious baroque or off-round over a perfect sphere. Yes, you pay a premium for the name, but the quality is there, too. At left, 15mm pink buttons glow on your ear like opalescent spotlights. Price, $450. 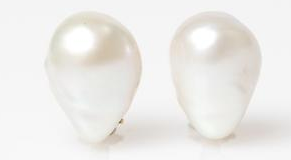 If you prefer white, they also offer e-normous (13.5 x18mm) baroque freshwater pearl earrings in pierced or clip versions, $1,259 (on sale). Romantic as a snowdrift lit by the moon. 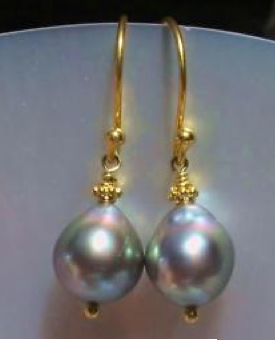 If you prefer drops, swoon over the exceptional luster and overtones on this pair of 10mm Sea of Cortez pearls on 22k gold earwires, from eBay seller Ehret Design Gallery (Carolyn Ehret). The rainbow overglow will shift and change with what you wear. Price, $479 on BIN. 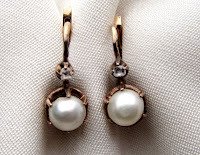 When shopping in antique and vintage shops, inspect the pearls to make sure the surface (or "skin") is uncracked. Pearls can last for generations when not abraded or damaged by poor care. This pair of Edwardian pearl and rose-cut diamond dangles is beautifully set and, though made around 1910, the pearls look luminous. Set in rose gold. Price, $525 from Isadora's. 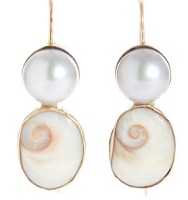 A modern pair by Sandra Dini in an unusual combination, pearl and shell:12k gold double drop earrings set with palest grey pearl and soft pink natural shell. 1 1/4 inch drop. Wire back. Price, $650 from Barneys. A pair of keishi earrings from Kojima Company reminds me of clouds over the sea; the play of blue, silver and mauve is accented by a small green diamond. Just over 2 inches long; set with 18k wires. Price, $280. Beladora II's pearl hoops wash out a bit in the photo but I'm certain they're lovely. 14k medium-sized hoops with 4mm pearls; price, $495. Whatever your style, look for the glow and shimmery overtones that evoke memories of the sea, the pearl's first home. Its second home is on your ears. O la la! They're all beautiful but I'm finding myself particularly intruiged by those keishis, so unusual! Lately I prefer pearls with an irregular shape, bringing the twist to the classic. Great post to kick off the New Year, Duchesse! I could enjoy wearing all of these earrings, especially the larger ones! I'll hazard a guess that you've had fun searching out these beauties. Bonne Annee, Duchesse! What a pretty collection of earrings. As usual... I'll take a pair of each, please. Yes, the hoops with the pearls are much more fabulous than they look in the photo! It is truly difficult to photograph pearls against a white background. Heavy sigh. I adore the pink ones. Happy new year! And happy new year to you Duchesse! Many women 'round here and maybe there too (?) wear diamond studs as their everyday earring. I like tiny bezel set ones but larger (and larger,etc. )stones start to look like competing SUVs (notice me, I'm bigger and certainly more expensive). I go for pearl studs. Some of the diamond stud only wearing ladies think a pearl stud is staid, old fashioned, conservative. Feh! I wear them with everything .Something about the light, and the essence, as you said. I loved everyone of your choices-especially the Edwardian antique. As I wear my pearl studs everyday - it is on and off for the shower, sleep, etc. I keep expecting the pearl to pull from the post. I don't hold it there when I take it off - but I have seen it happen. More than once. Oh these are all just lovely. I'm particularly attracted to the larger ones as well, which is not a surprise, although those hoops look like they will be beautiful. I find myself taken by the first pair. 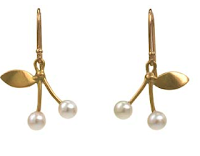 I like the combination of what looks like hand-cut gold leaves and the little pearls. Nice to have you back:). I would like to thank you, Duchesse, for your posts recommending Kojima. I finally figured out they were in Oakland - I'm next door in Berkeley - and I went to see Sarah last week. I now have two beautiful petal keishi pearl necklaces - one long with freshwater pearls interspersed, and one short with larger petals and a single tahitian pearl off-center. I love them both, and Sarah was wonderful to deal with. She is a true artist - and how envious am I of her career?? Thanks again. Those pink studs are just gorgeous. 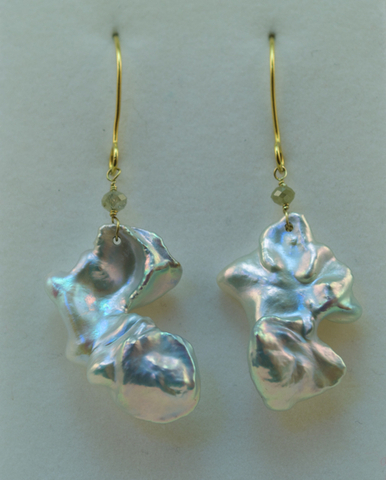 I have several pairs of pearl earrings, all of which get regular wear - so versatile and flattering, I think. I'm glad you're back, Duchesse -- hope your New Year is off to a wonderful start! Pseu: They are really cool earrings, you can tell! S. Let's have a glass of wine soon! Belle: No worries, they still look splendid! StacyfrPgh: OOOOh, what did you choose? Am sure you will enjoy them! Kristine: Then also check the loose pearls section of Kojima Company, they sell pink pairs for far less and can drill and make them into studs for you, or you can have that done locally. materfamilias: Thank you, it would be a good year if we could meet again. demi-pointe: You remind me of Chanel's comment that a woman wearing a diamond "might as well have a price tag around her neck". That huge-stud-by-day-look is not my taste. Lacks subtlety. Love pear studs, my favouries are 12mm off round whites with green and rose overtones I got on eBay for $35- total fluke. Ordered 2 more pairs immediately but they were only OK.
Mardel: The hoops would suit you! Or me. Timeshare earrings? spacegeek: Let me know if you choose something! rb: Definitely, resoundingly envious! There is no commercial connection b/t Kojima and me. I'm simply a lover of pearls who appreciates Sarah's taste and service. Tiffany: or is it "Happy New Ear"? Thanks! LPC: Annette F. makes beautiful pieces; I'll be showing more in an upcoming post. Happy New Year to you, too, Lisa! Rubi: Keishis are my favourites, such depth and play of colour. What a coincidence.....just checking out your post today...just a few hours to late though to help us in what we did today. Lyse and I were out shopping today and she bought a pair of teardrop fresh water pearl earrings to go with the pearl necklace I gave her at Christmas. I choose the necklace as my gift from the city for my 25 years of service and to give it to Lyse who had put up and endured 25 years with a firefighting shift worker. I think he deserved the gift more than I did! Jean: Some men know how to treat a woman! (Runs in the family.) Great to hear from you, Happy New Year!